It’s quite possible that Reade just kissed the wrong guy. Did Edison set her up to get back at her? Or is this part of the plan? Confused? Well, you probably won’t be next time! Whether Edison set her up or not, she is obviously more than pleased with the end result. Alot more pleased than Lyssa, for sure. Ooops. Love the composition on this page too. The first three panels really being one panel. 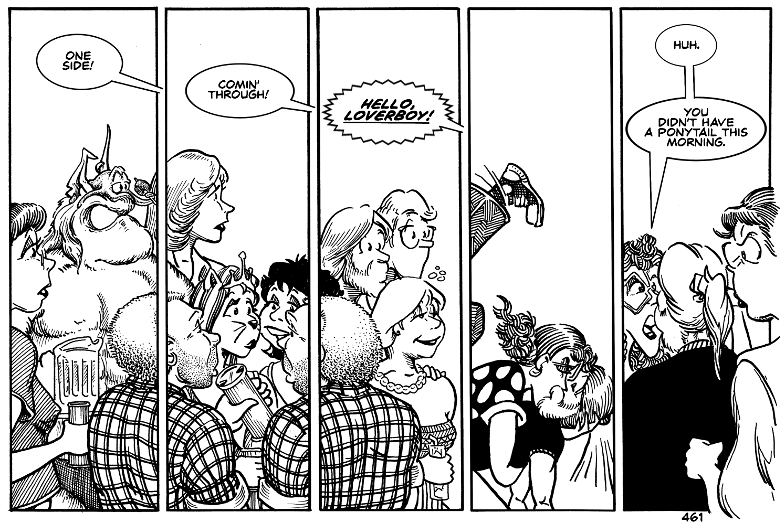 Originally I was going to show Reade barging through the crowd in every panel, but there just wasn’t room. I like it better this way. Yeah, Edison is happy with this. Setup or success? We’ll find out next time! If you listen really closely, you can hear the sound of karma whooshing toward Reade like an arrow. Or maybe that’s just the daggers Lyssa’s throwing. If Edison did plan this, I can’t say I blame her, though indulging in petty payback still won’t solve her problems. It does, however, create plenty of amusement for us, so carry on. Speaking of amusement, I promised you some violence in the next strip. Stay tuned! We’ll see how you feel about her next time. And yes, I admit I may have stolen the twins mix-up scheme from that play guy. You know, the one with the beard. Sometimes the best comedy is the comedy of errors. Does Edison even know enough about the whole pirate situation to set Reade up or, as melaredblu so aptly suggested, have Reade’s karmic pigeons come home to roost? Edison doesn’t know about the whole pirate thing, but she knows that Lyssa is pregnant and has a boyfriend. Whether she knows how Lyssa would take this is another story. Edison is definitely feeling no pain right now. Hi, I’m back from the hospital both me and my leg feel better. I caught up and I must say; Reade is about to find just Who she kissed. Your leg? As in you hurt it or it got pulled? She might’ve held that kiss a little longer than she should’ve. No, it was an infection that started in my right ankle and went up. Could not walk or drive well. Was in the hospital 24 days. The Good News, both my leg AND my kidneys are doing well. I missed you guys and am all caught up and working on Project 3: King Ghidora. Oh my gosh-scifijoe, that’s terrible! 24 days is a mighty long time to be laid up. We’re all glad you’re doing better. And that you’re leg and kidneys are doing well. I loves me some King Ghidora. I’ll go check it out! scifijoe, this is the second time I’ve noticed allusions to some mysterious project you’re working on in the comments. Well, it is not that mysterious. I am working on 4 projects for TusCon 42 at Tucson, AZ at the end of Oct. I have a page over at Deviant Art under my name. it explains more.